It’s almost Valentine’s Day! It can sometimes be difficult to create healthy Valentine’s Day dessert recipes. Instead of just handing over a typical box of chocolates or chocolate-covered strawberries, it would surely impress your partner to create homemade Valentine’s Day treats that you can both enjoy. Dessert ideas can be healthy and fun to make. People exchange gifts, candy, and chocolate in the name of St. Valentine. There are actually many legends of a St. Valentine, including at least three early Christian saints by that name. One was a bishop in Terni, another a priest in Rome, and another is virtually unknown. All three St. Valentines were reportedly martyred on Feb. 14. Over the centuries, Valentine’s Day evolved to the gift-giving holiday we know today. How can you continue the holiday tradition without succumbing to the mass consumerism associated with Valentine’s Day? Simply make your own desserts with real fruit, real chocolate, and other real ingredients that are both healthy and safe. 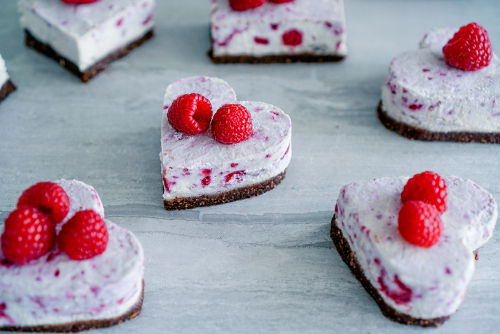 Here are five healthy Valentine’s Day dessert recipes that you and your partner will definitely enjoy. Does your partner love cheesecake but now has shied away from dairy? A good solution is a cashew-based cheese for your cheesecake filling instead. 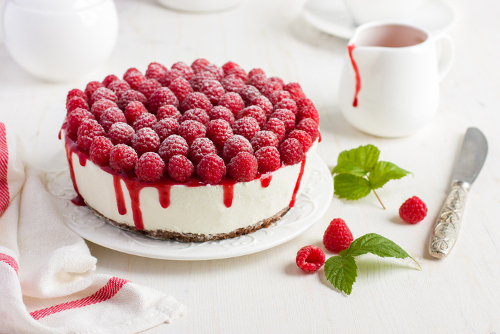 Raspberries also give this cheesecake recipe a red Valentine’s Day theme. Top it with more raspberries and shredded coconut. Soak the cashews in water to cover for at least four hours, or overnight, and drain and set aside. To make the crust, in a food processor or high-speed blender, combine the coconut, walnuts, dates, and cinnamon. Process the mixture until smooth but still a little crumbly. Press the crust mixture into the bottom and partway up the sides of a 9-inch springform pan, and place it in the freezer to chill while the filling is being made. For the filling, in a clean blender or food processor, combine cashews, the one raspberries, vanilla, and coconut oil, and blend until smooth. Add some honey if the filling is too tart. If using frozen raspberries, thaw them first, and drain them. Since the berries will be wetter, you may need to use some more cashews to compensate. Pour the filling into the chilled crust, and cover and freeze until it is solid and for at least four hours. Transfer to the refrigerator, and let it thaw for an hour before serving. Serve with fresh raspberries, and some shredded coconut. Chocolate recipes are a staple for Valentine’s Day treats. The following is a great combination of chocolate and almond butter that will truly melt in your mouth. The following recipe will make 18 to 20 chocolate almond butter balls. Stir almond butter before using. Line a large plate with parchment that can fit into the freezer. In a large bowl, stir almond butter, salt, and maple syrup vigorously for about a minute, until the mixture thickens. It is important to stir very well for the whole time so the mixture thickens enough to shape into balls. If the dough is too runny or sticky, stir in a tablespoon of coconut flour until thoroughly combined, and let it sit for a minute as the coconut flour will continue to absorb moisture. The dough should hold together well and shouldn’t crack. If it becomes too dry, add a bit more maple syrup, and mix again. Add the cereal, and use your hands to gently knead the cereal into the dough until combined. Shape the dough into 18 to 20 balls, and roll mixture between your hands. Place each ball on the parchment paper-lined plate. In a double boiler, melt the chocolate and coconut oil over low-medium heat, and stir frequently until smooth. Place each ball into the melted chocolate, and roll it with a fork until it is fully coated in chocolate. With the fork, lift the ball from the chocolate, and remove any excess chocolate. Place the ball on the lined plate and make sure the balls are not touching each other. Place the balls in the freezer for about 10 minutes until the chocolate is firm. Use any leftover chocolate for drizzling on the chocolate balls, and add back to the freezer for another 10 to 15 minutes until chocolate is completely set. Balls can be stored in an airtight container for five to seven days and in the freezer for about a month. This pomegranate poached pear recipe is sweet yet simple. Sometimes a delicious treat can be super easy to make. The following recipe is not only delicious, but the pears are also in fiber. This is very good for your digestion at the end of your meal. Place the pears in a three to four-quart saucepan, and add the pomegranate juice. Bring to a low boil over medium to high heat. Cover and reduce to low heat, and let the pears simmer while gently turning occasionally so they cover evenly. It should take 30 to 45 minutes until they become tender. Using a slotted spoon, divide the pears evenly on four plates, and set aside. Reduce the remaining poached liquid to a half-cup, and boil for 15 to 20 minutes. 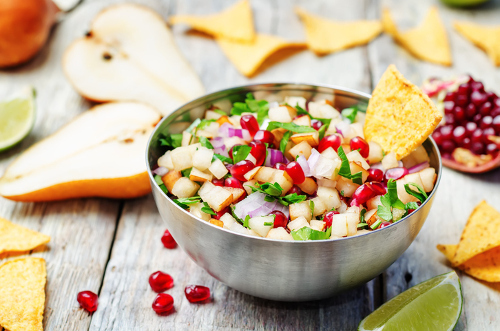 Drizzle the sauce over the pears, and sprinkle with pomegranate seeds, hemp hearts, and shredded coconut. You get four servings from this recipe. For all you coconut lovers out there, these almond coconut chocolate bites will definitely satisfy your sweet tooth and put you in the mood for…well I’ll let you use your imagination there. 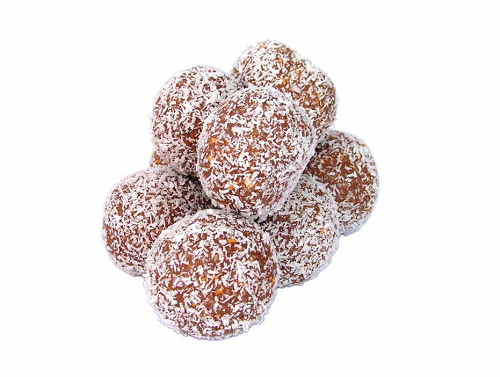 They are vegan, gluten-free and refined sugar-free, and you won’t feel guilty eating them. This recipe makes 12 treats, and hopefully that will be enough for you and your partner. Lightly grease a non-stick mini muffin tin with a little coconut oil, and set aside. In a medium-sized mixing bowl, combine shredded coconut, coconut oil, maple syrup, and vanilla extract. Combine well. Evenly divide the filling between the 12 mini-muffin cups, and press it in very tightly, and make sure it is even. Place the muffin pan in the freezer, sitting flat, and freeze for about 30 to 45 minutes until the filling is solid. Take the muffin tin with the frozen coconut mixture out of the freezer, and carefully remove each coconut treat from the pan by running a thin knife around the edge to loosen them out. Place them on a parchment paper-lined baking sheet. Using a double boiler on the stove top, melt the chocolate. Remove from heat once melted, and coat each coconut treat in chocolate. Sprinkle over toasted almond slices and additional shredded coconut if you want. Place the tray of treats back in the fridge and let them harden for about 45 minutes. Store them in the freezer or refrigerator until you are ready to eat them. What is Valentine’s Day without a little red wine and truffles? 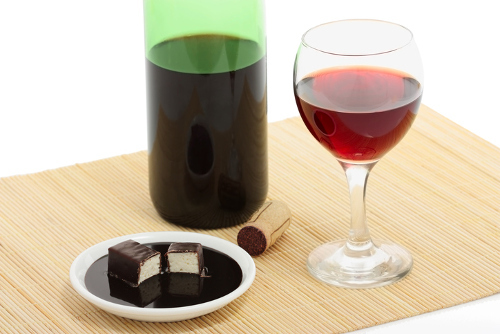 How about you save some of your red wine for your dessert? These red wine truffles are the perfect dessert after your Valentine’s Day dinner that will be sure to impress your significant other. After all, it only contains quality ingredients for your lover. This recipe includes coconut oil, coconut milk, dark chocolate, cacao powder, and, of course, the secret ingredient: red wine! The following truffle recipe will make about 24 truffles, but this depends on the size you make them. In a double boiler, heat coconut oil and coconut milk over a low/medium heat, and whisk until it is melted and well incorporated. Add the chocolate and stir continuously; do not let it heat up too quickly. As soon as it is melted, remove from the heat, and add the red wine. Stir very well to make sure it is all well incorporated and smooth. Be careful with the dark chocolate because it can seize up if heated up too quickly. Pour the chocolate batter into 8 x 8 baking dish or pie pan and refrigerate until the mixture is mostly set yet still pliable. This will take around 45 minutes to an hour. 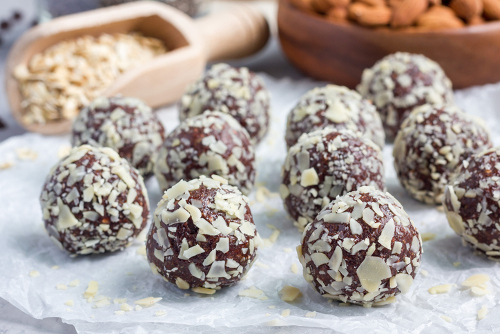 Use a tablespoon to scoop out the chocolate and roll into balls using your hands. Place the cacao powder onto a small plate, and roll the balls in the powder to coat. Place the balls on a parchment paper-lined baking sheet, and place the sheet into the refrigerator for about 15 minutes and up to overnight to fully set. The truffles will keep in an airtight container in the refrigerator for up to two weeks. Leave out for about 15 minutes at room temperature just before serving. Valentine’s Day is not complete without a dessert. Any of the aforementioned dessert ideas are sure to delight your partner. After all, you should not deprive yourself. A treat every once in a while can actually be beneficial as long as it is healthy. Take your desserts to the next level, and use natural and organic ingredients for your Valentine’s Day treats. McCarthy, J., Joyous Detox: Your Complete Plan and Cookbook to Be Vibrant Every Day (Toronto: Penguin Group, 2016), 255. Liddon, A., Oh She Glows Every Day: Quick and Simply Satisfying Plant-Based Recipes (Toronto: Penguin Canada Books Inc., 2016), 231-232. Daniluk, J., “Hot Detox: A 21-Day Anti-Inflammatory Program to Heal Your Gut and Cleanse Your Body (Toronto: HarperCollins Publishers Ltd., 2016), 314. Liddon, A., The Oh She Glows Cookbook: Vegan Recipes to Glow from the Inside Out (Toronto: Penguin Canada Books Inc., 2014), 259-260. “Almond Coconut Chocolate Bites – Vegan + Gluten-Free!” Free People website, Oct. 7, 2012; http://blog.freepeople.com/2012/10/almond-coconut-chocolate-bites-vegan-glutenfree/. “Dark Chocolate Red Wine Truffles – Gluten-Free + Vegan,” Tasty Yummies website; http://tasty-yummies.com/dark-chocolate-red-wine-truffles-gluten-free-vegan/, last accessed Feb. 7, 2017. Brunner, B., “Valentine’s Day History,” Info Please website; http://www.infoplease.com/spot/valentinesdayhistory.html, last accessed Feb. 7, 2017.